The Underwater Camera Housing Leak Detector is an electronic warning device that fits inside of many underwater camera housings. A sensor at the bottom of the housing detects any water (even the tiniest drops or moisture) and immediately triggers a flashing ultra bright LED light that can be seen by the photographer. The Leak Detector is designed for easy self-fitment in your digital camera housing. Each Leak Detector is custom made for many manufacturer's housing model's. 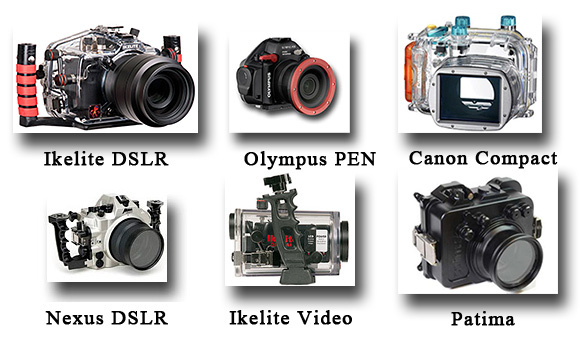 So all we need to know from you, is which camera and underwater housing combination you have and we can advise if we have a model in stock or if we need to make one. Each Underwater Camera Housing Leak Detector comes complete with full-precise instructions for the end-user to install in a few minutes. Absolutely no tools are required for installation. This is the cheapest underwater camera housing insurance you will ever find. Ikelite, Olympus, Canon, Sea & Sea, Nexus, Aquatica, Patima etc.. Contact us to see if we manufacture an Underwater Camera Housing Leak Detector for your particular digital underwater camera housing, or check-out our Product-Range to see what units we carry in stock ready for immediate shipment. The Underwater Leak Detector currently costs US$36 including air mail postage anywhere in the World. If you would like to purchase an Underwater Leak Detector, simply Contact Us to make sure we have a unit in stock for your digital underwater camera housing/camera combination. We will then provide you with a PayPal invoice by email with full, easy to follow instructions for secure payment. This PayPal invoice can be paid via your PayPal account, or by a Credit Card. You don't need to have a PayPal account to pay for your Underwater Leak Detector. Once you have paid for your Underwater Leak Detector, we will ship your product promptly. We will provide you with all necessary components and simple instructions for fitment. The Underwater Leak Detector can be fitted by the end-user into your digital underwater camera housing in less than five minutes. There are no permanent modifications made to your housing, the Leak Detector can be removed and no trace will be seen of where it was fitted. Have you considered placing a Sanitary Napkin in the bottom of your camera housing? In the event of a small leak, it will absorb water and hold it away from your camera and lens. It could save your camera. Read more information here. 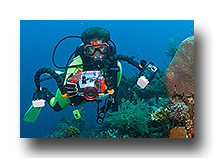 Need some instruction on Underwater Photography? Then contact Jeff Mullins the inventor of the Underwater Camera Housing Leak Detector. He runs one-on-one underwater photography courses in Tulamben, Bali and Live-Aboard Underwater Photo Cruises.